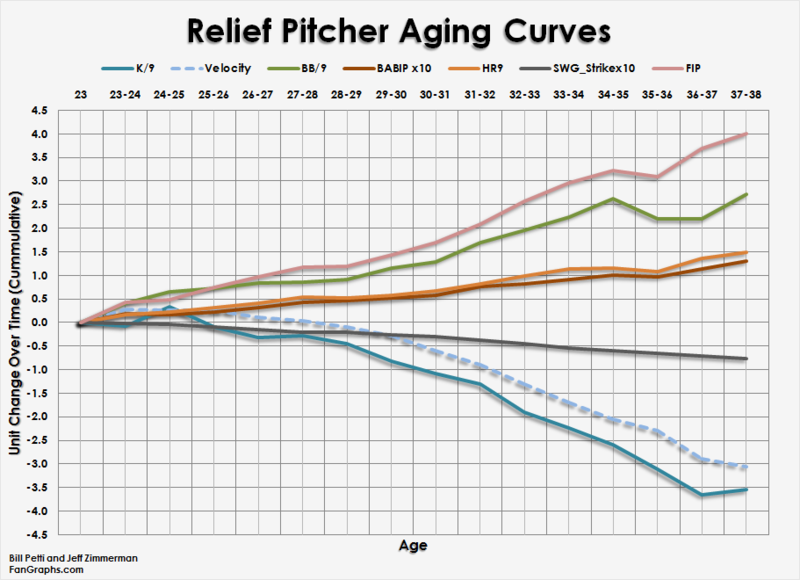 On Monday, Jeff Zimmerman and I launched our series of articles on pitcher aging. Readers should refer to introductory article, which includes general curves and a summary of the methodology. The general takeaway was that, as suspected, pitchers age differently than hitters. 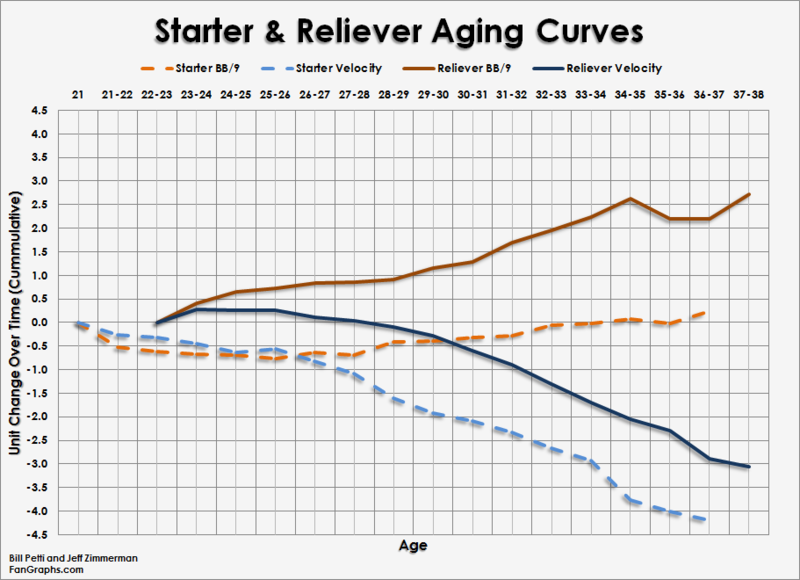 Generally, pitchers see their velocity peak in their early 20s and steadily decline by a full mile per hour by age 26. After that, velocity drops more sharply and continues a steep decline into a pitcher’s 30s. Strikeout rates were tied to velocity, but not as closely after age 26. This indicates that those pitchers who survive into their late 20s and early 30s are less reliant on their velocity (and, most likely, their fastball) for strikeouts. A pitcher’s walk rate shows a some improvement through age 25 (due to starters), and then begins its decline. In this article, I want to tease out some of the differences between starters and relievers. 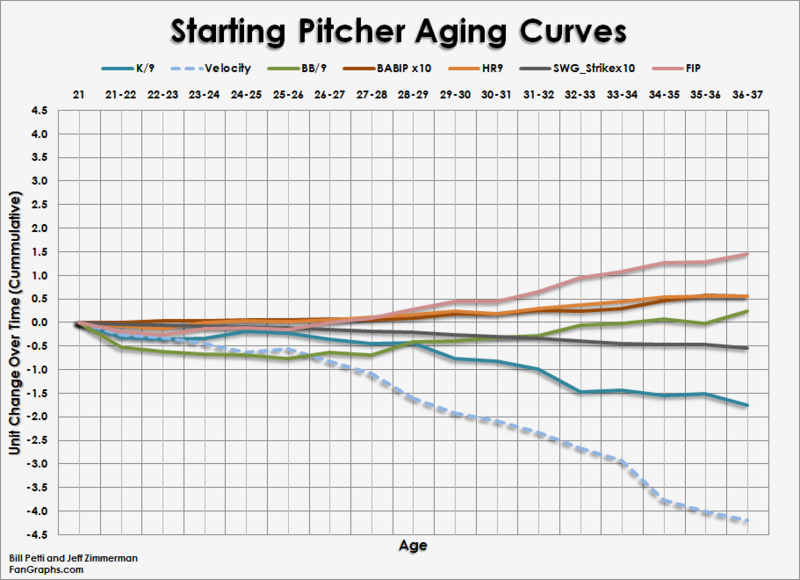 Readers will notice that the ages for the curves differ by pitcher type. This is due to sample sizes at the various age levels. There are more starters younger than 23 who pitch in back-to-back seasons than there are relievers. Similarly, we were able to get enough relievers pitching in their age-37 and age-38 seasons, whereas the sample was just too small to include starters. As we noted in the introduction to the series, the curves are different in a number of ways. In general, relievers age more dramatically than starters. While relievers don’t lose a mile per hour against their peak fastball velocity until their age-32 season, the fate of the strikeouts-per-nine-innings is more closely tied velocity. Starting pitchers don’t lose a strikeout-per-nine until their age-32 season. And relievers? The dip begins a year earlier, during their age-31 season. Losing velocity could indicate that a starter’s likely to see a decline in performance — but we see that the ability to be effective (particularly in terms of strikeouts) is less affected by velocity than compared to relievers. By their age-34 season, relievers lose more than two strikeouts-per-nine against their peak. Starters don’t see that kind of decrease in their strikeouts-per-nine until their age-39 season. This also speaks to the survivor issues in the data; starting pitchers who lose their strikeout ability faster likely are moving out of the rotation at later ages. Basically, this means that those who remain in the rotation are likely to age slower. To show the differences in starters I decided to plot the career of CC Sabathia against Scott Kazmir. Both were hard-throwing lefties who had great success early in their careers (FIP- in the high 80s and low 90s in their first two seasons), but — as we know — one went on to have a dominant career while the other was out of baseball by 27 years old. 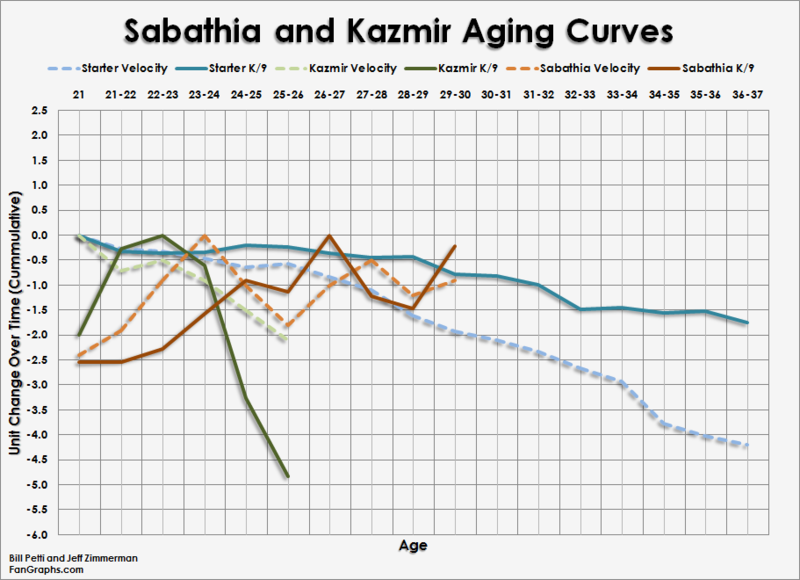 While Kazmir’s velocity peaked at 20 years old, Sabathia represents the above-average starter in our study since he didn’t peak until his age-24 season. While Sabathia’s velocity has slowly started its decline (roughly 1 mph, versus 2 mph for the average starter by age 30), his strikeout rate has remained high. This is similar to what we found, in general. Kazmir, though, represents the below-average starter. Due to various issues — primarily injuries — Kazmir watched his K/9 ratio decline sharply starting in his age-25 season. By 26 years old, both pitchers lost roughly 2 mph, relative to their peak velocity. But Sabathia’s K/9 had not yet hit its peak — and Kazmir’s K/9 had dropped by almost five. Kazmir would pitch in one more game in his age-27 season before essentially ending his career. Sabathia steadily decreased his reliance on the fastball, while Kazmir stuck to it — even while the pitch’s velocity declined. Starting pitchers see a slight decline in their home-run rate (HR/9) through age 23 and then start a steady rise throughout the rest of their careers. By age 26, starters gain an extra .03 to their HR/9 for every mph they lose on their fastball. For the rest of their careers, the highest the ratio is .15 (age-34 season). Relievers see a more drastic ratio of HR/9 to velocity. 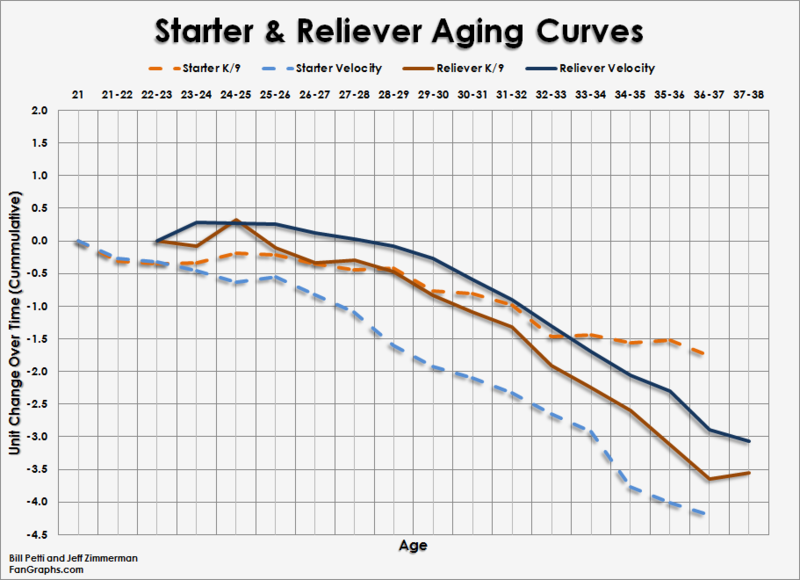 Once their velocity starts its steeper decline (age 26), their ratio never gets below .47. This again illustrates how closely reliever success is tied to velocity. The first thing that jumps out is that — unlike starters — relievers begin to increase their BB/9 from the outset. 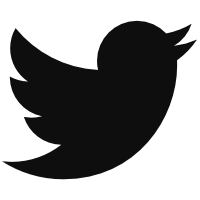 The rate at which they do this decreases from age 25 through age 29, but accelerates again after that. Starters experience a general improvement in their walk rates through their age-26 season and then begin to decline; but the decline is much more subtle than relievers. What’s interesting is that a starter’s walk rate really begins to jump at about the same time as their steeper velocity decline kicks in (ages 26 to 27). My initial thought here is that as velocity declines, hitters might be staying away from off-speed pitches outside the strike zone more often simply because they don’t have to start their swing as early on the fastball. The more hitters think they can wait to recognize the pitch, the less likely they are to turn secondary pitches out of the zone into strikes — which leads to more walks. Relievers, on the other hand, have picked up a full walk-per-nine, relative to their peak by age 30. Starters, though, move within +/- one as they age. If hitters don’t fear the fastball, they can more easily lay off the secondary stuff. This not only would lead to fewer strikeouts, but also would result in more walks. So there you have it. There’s still more to come, particularly from Jeff. Starting this week, he’ll be following up with some additional differences between starters and relievers — as well as how aging differs when pitchers are able to better maintain their velocity during their careers. You’ll also likely see additional articles that use the aging curves in the service of specific pitcher analysis. 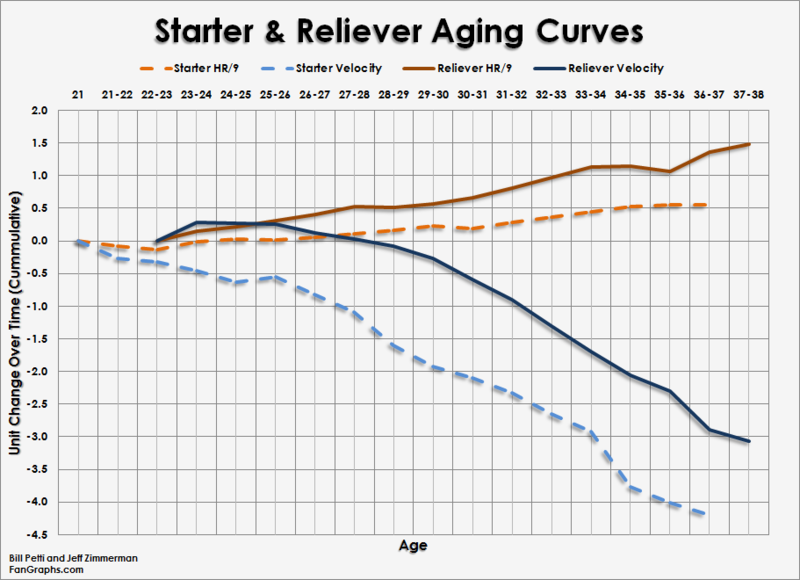 We hoped you liked reading Pitcher Aging Curves: Starters and Relievers by Bill Petti! Took a look at Kaz’s pitch selection and he never did give up on that fastball. From 2009 on, his SwSt% just got worse and worse, even though the fastball only dipped about 1.0mph from 2008-2010 before the wheels fell off in the 2011 start. Just completely lost the ability to find the strike zone consistently and when you can’t do that, it doesn’t matter if you throw 97 it’s not going to work. Shame, he was the lone bright arm of a pretty bad Devil Rays team for a good 3 years.